Questions regarding the development of decentralized applications (a.k.a. DApps). This can include everything from frontend development questions to interaction with the blockchain and distributed file storage. A DApp has its backend code running on a decentralized peer-to-peer network. Contrast this with an App where the backend code is running on centralized servers. A DApp can have frontend code and user interfaces written in any language (just like an app) that can make calls to its backend. Furthermore, its frontend can be hosted on decentralized storage such as Swarm or IPFS. If an App = frontend + server, since Ethereum contracts are code that runs on the global Ethereum decentralized peer-to-peer network, then: DApp = frontend + contracts. 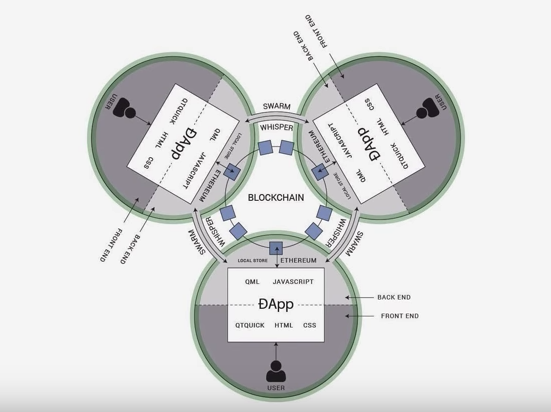 An illustration of a DApp that uses a blockchain with smart contracts combined with the pillars of Swarm and Whisper. Read more: What is a DApp?